‘The Armageddon Factor’ marks the final six episodes of the twenty-six comprising the season-long The Key to Time arc, and unfortunately it confirms fears that the quest for the segments was simply a loose linking device for this season’s individual stories rather than a central component that would pay tremendous dividends or perhaps even radically alter the entire programme’s mythology. 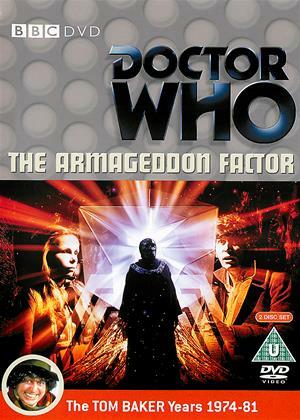 Instead, ‘The Armageddon Factor’ is a distinctly mixed affair that suffers from far too much padding and its inability to do something meaningful with the Key to Time. The actual setting for the search for the final segment is fascinating, at least, as the Doctor and Romana find themselves in the middle of a nuclear war between the twin planets of Atrios and Zeos. With the Atrian Marshall bent on continuing aggressive strategies even as his forces are reduced from a lowly six ships to just his own escape vessel, their political leader, Princess Astra, proves willing to sacrifice everything as she tries to negotiate a cease-fire. Even when the Doctor inexplicably finds himself thrust into a position of power, he never takes the situation unduly seriously and is always quick with a quip to break through the severity of the situation. Fortunately, Baker is at his best as he asserts a more superior air about him than in earlier stories, and this performance helps to carry the narrative as it devolves from a smart story about the complexities and tragedies of an unending war to a rather stereotypical runaround full of gaps in logic and sense. Being the final story of this arc, it makes sense that the antithesis of the White Guardian and his agent is finally revealed. It’s quite fitting as well that the entire war is simply a trap laid for the Doctor by the mysterious Shadow working for the Black Guardian. Valentine Dyall is superbly menacing in his brief scenes as the Black Guardian, creating an aura of immense power about himself instantly. Unfortunately, William Squire’s Shadow fails to evoke that same sensation as his shallowed and clichéd corniness undermines any credibility of the character. With the Black Guardian able to reach anywhere in the cosmos, it seems odd that his agent of choice would be one who simply waits for the Doctor to appear to ask him to hand over the segments. As a result, there’s a strangely unnerving discrepancy in tone, and the story never really settles on what it wants to be. At the same time, little effort is made to flesh out any of the secondary characters, Astra’s ill-fated boyfriend, Merak, and the unnamed Atrian Marshall are prime examples. The unexpected appearance of the Time Lord Drax does add some momentum and a certain surreal quality as he propels the plot to unexpected places, but his appearance comes too late to rescue what the script has already become at that point. Even after creating a time loop to prevent total annihilation, though, neither the Doctor nor anyone else is ever able to further expand upon what the Key to Time actually is or what it is meant to do besides restoring an unseen balance to the universe. More egregiously yet, the segments are instantly dispersed just as they are collected when the Doctor sees through the Black Guardian’s ruse, essentially rendering the entire season null and void with little consequence. ‘The Armageddon Factor’ has some clever moments in it, to be sure, but its padding and lack of attention to detail as well as its inability to prove that the Key to Time is worth the effort make it a rather lackluster season finale, especially a six-part one. In retrospect, the season could have just as successfully been six completely independent adventures with no linking device at all; as it is, the Key to Time and the mysteriously powerful Guardians still have an abundance of untapped potential for something altogether more fulfilling.